There exists a unique protagonist central to the story of any human existence. The family and friends inherited and loved along the way comprise the remaining cast of characters, but no matter how cherished or profound their essence is to the whole, the story of a single life remains true to the core definition of one: man versus nature, the lonely abyss of life and love revealed. You come into the world as you leave it. Alone. Transition to a great riddle of human relationships: how to merge two into one despite the unbreakable laws of nature. 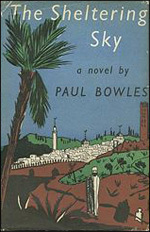 In his novel The Sheltering Sky, Paul Bowles offers a brutally honest examination of the difficulties inherent within the attempted join. Lost in a day that is not wholly unlike another, a man and woman find themselves further exiled inside retreating selves, alienated in their own thoughts, desires, and fears, and ultimately incapable of achieving the requisite depth of communication needed to stabilize a deteriorating union or veer from paths of deepening isolation. While these or any subset of these symptoms of relationship decay may not seem all that uncommon, they are magnified amidst an unforgiving desert, a place where skeletons are routinely laid bare in full view of the living. Here, exposure to the elements is as deadly as it is inevitable and the daily struggle for survival is as commonplace as the scorching sun, the sand, or the mind-decaying silence that clings to the burning miles of impenetrable emptiness. The desert landscape is always at its best in the half-light of dawn or dusk. The sense of distance lacks: a ridge nearby can be a far-off mountain range, each small detail can take on the importance of a major variant on the countryside’s repetitious theme. The coming of day promises a change; it is only when the day has fully arrived that the watcher suspects it is the same day returned once again—the same day he has been living for a long time, over and over, still blindingly bright and untarnished by time. The desert wasteland is no place for the weak or weary, nor lonesome traveler. And yet, perhaps tricked by its serenity, desert wayfarers are easily hypnotized to the siren song. Familiarity offers a realignment of bearings so enticing that the invitation becomes as impossible to refuse as a high noon swig from a near empty canteen of water. He was nowhere; there was the certitude of an infinite sadness at the core of his consciousness, but the sadness was reassuring, because it alone was familiar. When surroundings fail to offer stability or adequate protection and the foundation between two continues to show signs of cracking, human nature kicks in, seeding the belief that all will still somehow be okay, that there inevitably must exist a place of refuge up ahead. It is a mirage that propels the traveler onward toward an imaginary destination that remains perpetually out of reach. Whereas the tourist generally hurries back home at the end of a few weeks or months, the traveler, belonging no more to one place than to the next, moves slowly, over periods of years, from one part of the earth to another. Indeed, he would have found it difficult to tell, among the many places he had lived, precisely where it was he had felt most at home. The enduring lure of the expansive sheltering sky may be playing the cruelest trick of all, disguising within its enormity and profound beauty a false and surreal sense of security. The journey continues. The seeker seeks. Surely somewhere under the sky’s soft and watchful eyes of blue, any lost soul will find a way home. The sun’s fires scorch the barren wasteland as life remains suspended in the glowing. The earth is round, but maybe not perfectly so as twilight reveals two silhouettes creeping closer and closer towards an edge, teetering, teetering. . . .
All the while, the sky observes the unfolding drama with a quiet and peaceful indifference.